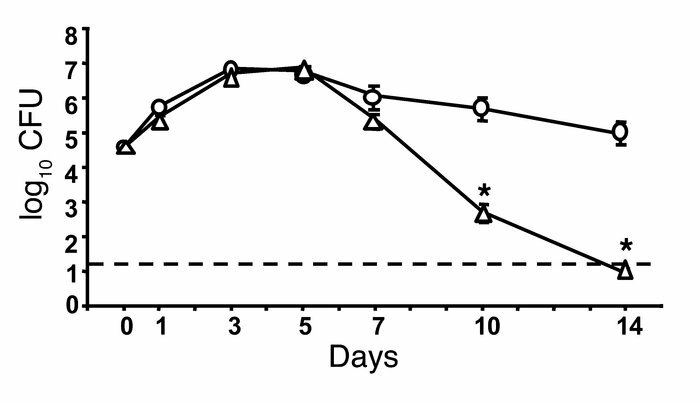 Serum antibodies clear B. pertussis after 7 days of inoculation. C57BL/6 mice were inoculated with 5 × 105 CFU of B. pertussis and adoptively transferred with 200 μl of naive serum (circles) or convalescent-phase serum (triangles). Lungs were harvested on the indicated days, and bacterial numbers were enumerated and expressed as geometric mean ± SEM. Dotted line denotes limit of detection. n = 4 per group. *P < 0.001.